Deshaun Watson didn’t shoot an arrow at the end of the game. Hell, he might have been too sore to. 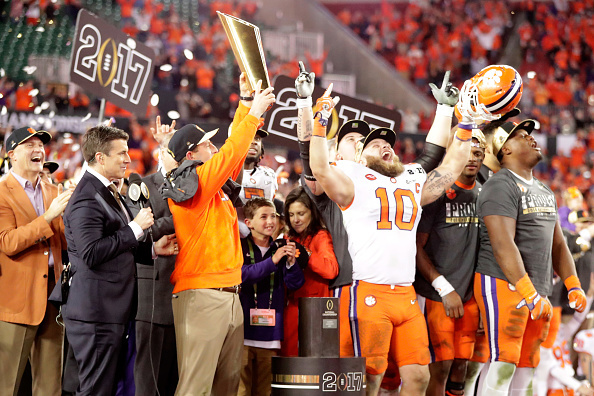 But it was his “tell your grandkids about it” performance that made Clemson CFB Playoff champions Monday night, outlasting previously unbeatable Alabama 35-31 with a touchdown with one second remaining by Watson to Hunter Renfrow. “It’s a movie. It’s gonna end the right way,” said Watson after the game had ended, echoing what an unnamed coach had told him prior to the game. Clemson scored 21 points against a Crimson Tide team that had let by only 32 all season long. They got revenge for their narrow 45-40 loss to Alabama in the championship last year, and Watson put up a virtuoso performance, the likes of which has not been seen in college football by an individual on such a grand stage since Vince Young bested Southern Cal in 2006. He finished with 420 yards passing and accounted for four touchdowns. Truthfully, this was as good as college football gets. Neither team really lost the game. Clemson won it. Someone had to. It’s not an art fair. There were no back-breaking turnovers, missed tackles, calls left out on the field. At different times in the last five minutes, you were sure Clemson was going to win. Then you were sure Alabama was going to win. Then you were sure Clemson was going to win because there was no time left to be sure Alabama was going to win. The game looked headed for 2016 (remember that year?) after O.J. Howard found himself (again) wide open against the Clemson secondary for a 68-yard touchdown that put the Tide up 10 in the second half. Surely, that was it, right? Nah, Clemson refused to die and got a Mike Williams touchdown catch and an ensuing Alabama punt to really turn the tables on the outcome of this game. If you were watching at home, you finally felt for the first time like this one may slip away from the unbeatable Tide. in the 2017 College Football Playoff National Championship Game at Raymond James Stadium on January 9, 2017 in Tampa, Florida. Clemson immediately took the ball down the field, culminating with a 1-yard Wayne Gallman touchdown run, Clemson’s second of the night. That, in this single game, equaled over half of the rushing touchdowns the Tide had given up over the course of the season. The Tide showed their own resolve with quarterback Jalen Hurts. Hurts was maligned all night as Alabama went bizarrely conservative with their play calling early, lost Bo Scarbrough to injury in the third quarter, and struggled to find consistency until the last drive. However, he came through under pressure, and bolted into the end zone from 30 yards out late to put the Tide back in the lead. Surely that was it, against this Alabama defense, right? But Watson was not to be denied, even in spite of sketchy clock management that looked like Clemson was highly content settling for a field goal if that’s what it came down to. 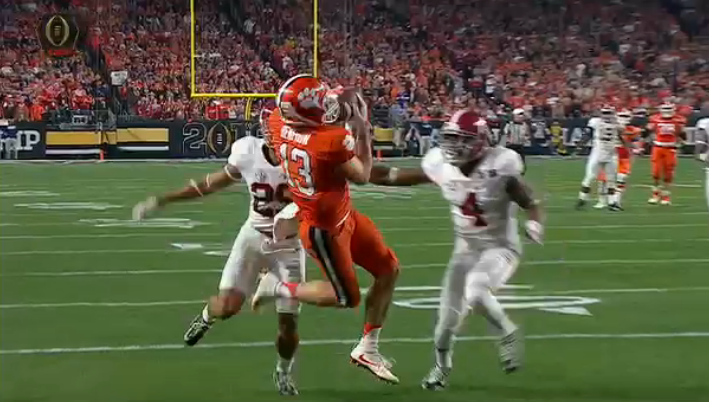 Jordan Leggett made a stirring catch to put the Tigers inside the 10 and Williams was incredible again as it came down to one play, one that’ll be an eyesore to Alabama fans everywhere as the second controversial pick play along the goal line in two years that ended in a Clemson touchdown to Hunter Renfrow. As it stands in history, the Tigers are college football’s best for the first time in 35 years after winning one of those games you’ll remember until forever if you’re a fan of the sport. “I want to be legendary,” Watson panned after the game when talking about the aforementioned Young. Young fella, that deal has been sealed.